In the 19th century, the Kingdom of Dahomey was a major West African power, boasting a flourishing slave trade with Europe and a feared corps of Amazon women warriors. Commissioned by the royal court, its art — intricate wood and ivory carvings, metalwork and appliqué cloth — stood as a potent symbol of the kingdom’s might. But by 1894, Dahomey was annexed by France after a pair of brutal wars. Its artifacts ended up in French museums and private collections. Now modern-day Benin, the seat of the former Dahomey kingdom, may have the best chance to date of getting them back, as French President Emmanuel Macron vows to make the return of treasures from former African colonies a top priority. That vow will be tested next week, when Benin President Patrice Talon visits France. Restitution of Dahomey artifacts is expected to rank high in (March 6) discussions between the two leaders. “The question is to give back what has been stolen during the worst conditions of war,” said Marie-Cecile Zinsou, daughter of Benin’s former prime minister and president of the Zinsou Foundation, an organization in the main city, Cotonou, that promotes African art. Beninese art expert Marie-Cecile Zinsou says her country’s art can be found in many Western capitals — but not in Benin. 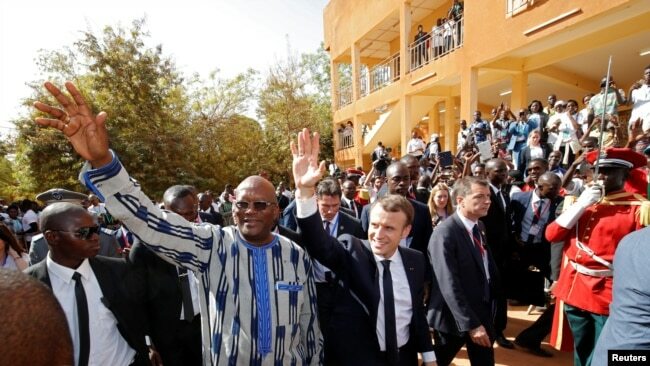 French President Emmanuel Macron and Burkina Faso’s President Roch Marc Christian Kabore leave the Ouagadougou University, in Ouagadougou, Burkina Faso, Nov. 28, 2017. Experts believe that if realized, France’s example may prove the tipping point for other former colonial powers, similarly pressured by restitution claims. But while much of Africa’s cultural heritage lies outside the continent — stolen, sold or otherwise expatriated by European soldiers, missionaries and Africans themselves — returning it lays bare a tangle of difficult questions. Who should receive artifacts that may have changed hands and borders many times over the years? Should private collections, as well as national museums be compelled to return the treasures? And would those returns be permanent or temporary? In France, repatriation may also demand changing current law that recognizes the artifacts as inalienable cultural heritage. Skeptics argue that many African countries lack national museums or other spaces capable of housing old and fragile artifacts. And apart from a handful of exceptions like Benin, some say, few governments have mounted strong restitution campaigns.